Her name is auspicious, referencing as it does strength, holiness, and silver's purity. Judith Fitzgerald - poet, critic, journalist, and editor authored twenty-plus collections of poetry as well as three volumes of creative non-fiction. Awarded a Chalmers Arts Fellowship for poetry. Nominated for the Governor General’s Award. Shortlisted for the Trillium Award. Shortlisted for the Pat Lowther Award. Her collection of ghazals and sonnets, Twenty-Six Ways Out of This World (Oberon Press, 1999), was named one of the six best poetry collections of the year published in English (The Globe and Mail’s Top 100); additionally, The Globe and Mail designated her completed Quartet one of its 100 best 2007 English-poetry works. As senior contributing literary reviewer for The Globe and Mail she earned the Fiona Mee Award for her “outstanding contribution to English-language literary journalism." As noted in The Canadian Encyclopedia: "Whatever her subject, Fitzgerald's point of view indicates a principled engagement with the cultural determinants of our world. It is in her poetry that we find the seeds of this engagement. Her poetic voice takes in all manner of experience, from daily occurrences to themes from the ancient classics, and absorbs them into a personal style that is as rich in sonorous language as it is precise in pinpointing the inherent being of her subject and its relation to our living reality." 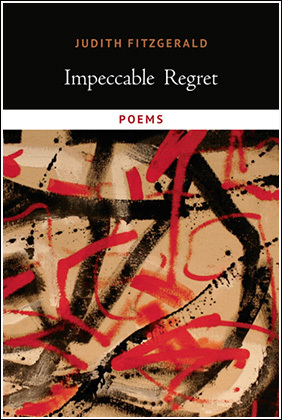 In October 2015 Ms. Fitzgerald launched her last book, Impeccable Regret (Talonbooks) at BookFest Windsor in conversation with Tom Dilworth. HA&L is proud to honour her memory by republishing a poem that Judith dedicated to us – first published in issue 8.1. Judith died on November 30, 2015.